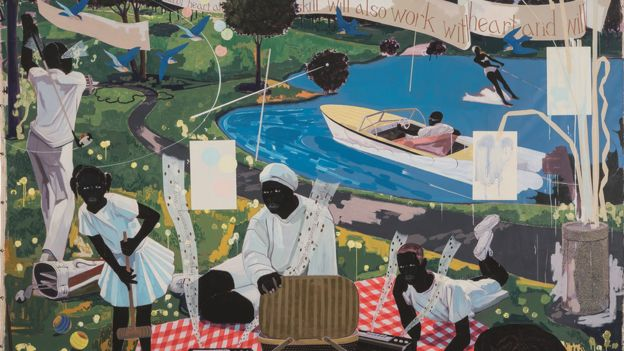 (BBC) - Rapper Sean "Diddy" Combs, also known by his stage names Puff Daddy and P Diddy, has been revealed as the buyer of a Kerry James Marshall painting that fetched $21.1m (£15.6m) at auction. The sum is believed to be the most ever paid for a work by a living African-American artist. The painting, Past Times, depicts black Americans picnicking, waterskiing and listening to music in a Chicago park. It measures up at an imposing four metres (13ft) wide. Jack Shainman, Marshall's gallerist and art dealer, confirmed the identity of the new owner. "I know that this work has found a home in a collection with purpose and an eye toward preserving legacy - that of Sean Combs - and that means a lot," he told the New York Times. Diddy went to Sotheby's auction house to view the picture, according to the paper. The painting had been expected to fetch around $8m. In the event, its price was four times higher than the previous record for a work by 62-year-old Marshall. Chicago's Metropolitan Pier and Exposition Authority (MPEA) sold Past Times for more than 800 times what it paid in 1997, the year the work was completed. The MPEA originally bought the piece for $25,000 from the Los Angeles Koplin Gallery. Marshall is known for painting scenes of African-American life. He was born in Alabama, and grew up in south central Los Angeles before moving to Chicago. The artist received a MacArthur Foundation genius grant in 1997, and previously taught at the University of Illinois at Chicago. The MPEA is required to spend a share of its budget on art for public display, and currently owns more than 100 pieces. Past Times had hung in the McCormick Place Convention Centre in Chicago, gradually accruing value. Sotheby's said there had been four bidders for the picture. Combs' winning bid was apparently delivered by phone.